On the surface, the Jumping Rubber Band Trick may seem basic at first, but just by simply using the phrase “but it gets better”, the simplest of concepts t urns into a seemingly more technical performance that can captivate an audience. Having a catchphrase or repeating words between each magic trick can work as a linking mechanism that can captivate and intrigue your audience. With enough charisma and repetition you can get the audience to recite the catchphrase before you’re even said it. This level of audience participation acts as a sign of comfort and enjoyment from your audience and puts you in a good position as a performer. This is what we are looking to do with the Jumping Rubber Band Trick. This catchphrase is called a segue and to run a smooth and crowd pleasing show you must produce and include catchy and entertaining segues. One of the most frequently used style of segue is a progressive segue. 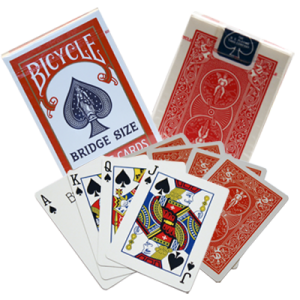 For example if you were doing a card trick that required you to try different amounts of cards, you could say, ‘Alright let’s try with three cards’ then you could say ‘what about two cards’ and then ‘how about one card!? !’ This adds a natural progression to your routine. There are many different ways to add progression into your act. You could make things bigger, you could make things smaller. Your segue’s should accommodate and add a flow to these progressions in your act. It’s important to give the illusion that the magic trick is progressively becoming more difficult as it progresses when in reality it is the same difficulty or possibly even easier. In this Jumping Rubber Band Trick, the final step is really just as simple as the first step of the trick. I lead the audience to believe that it is harder by physically telling them it’s harder. 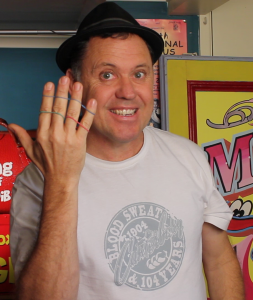 The power of words is important in having control over how the audience perceive your magic tricks. 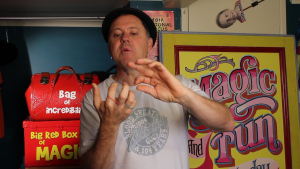 Did you enjoy this Jumping Rubber Band Trick? To learn more simple magic tricks Click here!